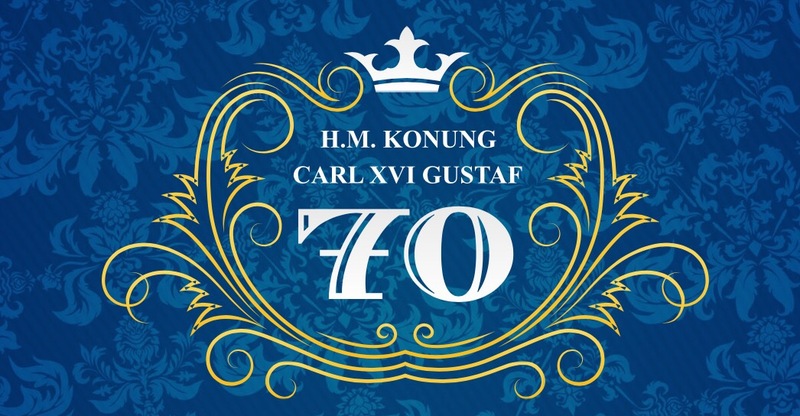 Today is the birthday of King Carl XVI Gustaf of Sweden and he celebrates his 70th birthday. A big day for Sweden. 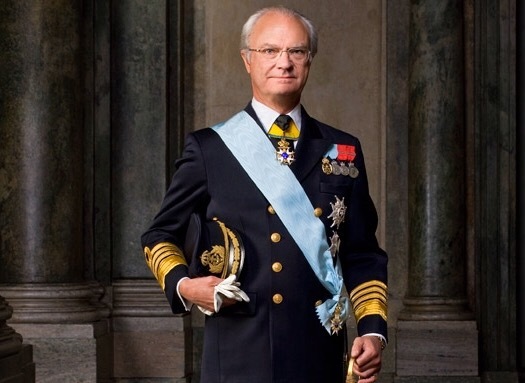 Carl XVI Gustaf, or in his full name Carl Gustaf Folke Hubertus Bernadotte, has been King of Sweden since 1973, when he was crowned at age 27. King Carl Gustaf has three children, Crown Princess Victoria, Prince Carl Philip and Princess Madeleine. This year the Princesses and the Prince have all had new family members the last year. The Crown Princess has two children with her Prince Daniel, Princess Estelle (4) and Prince Oscar. Prince Carl Philip has a new born child with Princess Sofia, Prince Alexander and Princess Madeleine has two children with Chritipher O’Neill, Princess Leonore (2) and Prince Nicolas. The Swedish Queen, Silvia – that is very popular in Sweden – has a German father and Brazilian mother. 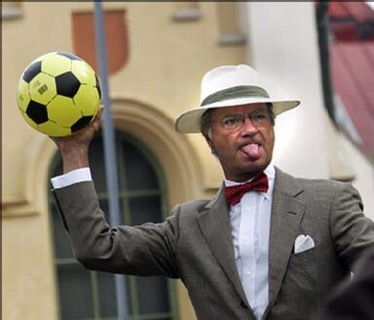 King Carl XVI Gustaf is kind sports fan and always follows the Swedish national teams with great interest, especially during Olympic Games. In fact His Majesty found his wife Queen Silvia during the 1972 Olympic Games in Munich. Thus the Swedish Royal family will indeed be present at the 2016 Olympic Games in Rio, taking into account the Queen and her family is from Brazil. I have met the King and Queen four times during official interntional visits abroad. I have also met Crown Princess Victoria, from who I recieved the Gothia Price for Best Swedish Innovation of the Year – for the innovation of the AEO (The Stairway). We have been talking about the global supply chain for at least a decade. Ten years ago we didn’t really know what it would look like but now we know more. Even though we are only in the very beginning of the age we are entering, the world of globalization. It is an exciting new universe we are about to enter and we know very little about it. Already today we move goods in totally different ways, according to other trade patterns and with much higher speed and predictability than ever before. And this is just the warm-up. We are starting to see the new global supply chain. We are learning through academic studies like the EU Cassandra project and many other similar academic research studies, how the global supply chain function and how it evolves over time. We see new global value chains in almost every sector, where goods for different reasons are manufactured in many places, assembled in many places – and moved back and forward around the world before ending up in global markets and later our stores. I am in personally involved in three different projects – in different parts of the world – that is about designing and testing new superhighways entirely changing the way we operate today in Customs and Trade. This is not science fiction, but already existing. An artist called James Herbin once said that, ‘the future is so bright that I gotta where shades’. I genuinely believe that we the next ten years will totally re-design the way we do business. The next time period will give us more changes and opportunities for change – than the last hundred years did. Are you ready for the future? I am. Let it come. I saw him play the first time when he was only 12 years old. I saw his first game for the first team of Malmö FF. I have watch live games that he had played in Amsterdam for Ajax, in Torino for Juve, in Milan for AC, in Barcelona and for PSG in Paris. I follow all his games on TV. National team, national league, cups, Champions League, friendly games. I read his book many times. I read all articles about him in international media, I watch the press conferences and the YouTube movies about his skills and goals. I even wear his perfume brand. Am I totally crazy? No, not at all. I just love the sport, the game, the player, the character and the person. He is Zlatan Ibrahimović. For me he is the best player in the world ever and I am grateful to have lived during his career to see him play. I have visited 164 countries to date. I have worked with international missions for twenty years now. I have seen the world from airplane and airports. I love travelling. Going to new places, meeting new people. It is all about learning. Life is learning process. At least for me. So I travel. I know that I have travelled around the world many times already and I have spent more time in airports than I want to. The only really hard thing about international work is that you are away from home. Having said that, the journeys I have done have taken me to places I never thought I would see. When I was a kid in small village in the South of Sweden we almost never travelled anywhere. Now I have seen all of the world. That is probably the longest journey I have done. I will continue to travel until the day that I die. The world is a beautiful place. On this blog I will give you my insights to travelling, airplanes, airports, countries. So if you want to travel with me – stay tuned and read this blog. I will share my experience of travelling here and only here. In 1982 I visited Paris with some school friends. We lived in a bad hotel somewhere in the Paris suburbs for a weekend. On the street there was a bar, like a rock club. One of the nights there we watched a fantastic band playing music in a new way that I never heard before. We all loved it. I didn’t even catch their name that time. But some weeks later I saw the same band playing on Swedish television when visiting Sweden. I never forget that they started their show with the worlds, ‘we are a band from Ireland and we call ourselves U2’. They still sometimes start their shows with these words – except today everybody knows who they are. A few months later I read an interview in the magazine New Musical Express (NME) with the front man and singer of the band, Paul Hewson – also known as Bono. The name taken from the words Bono Vox, written in a shop window of a music store in Dublin. This interview fascinated me. I was 18 years old, Bono was 20. He talked with words of a global politician already then, and he has not changed since. I have loved U2 for so long, I have all their records and I have been to many concerts. The music just related to me. It is like it is written for me and I am sure that millions of U2 fans around feel the same. Today U2 is the biggest rock act in the world. Their different moves to release albums on-line or with Apple are innovative and legendary. However Bono of U2 is also an extraordinary man. He is one of my true role models, heroes and idols. Not only since he has creates amazing songs, great lyrics and fantastic music – but also since he has used his fame for something good. Bono has started a number of initiatives like RED, ONE and DATA. He is working with UN and Amnesty International. He is constantly engaged in the fight against poverty and goes repeatedly to Africa to contribute. He has met more Presidents, Prime Ministers and world leaders than any other musician in the history of the planet. He was a personal friend of Nelson Mandela and he is meeting Desmond Tutu on a regular basis. He is just one of those guys. He wants to make a difference. It is honest. I love that attitude. That is why Bono will always be a hero in my book, a hero of my time.